Hello everyone! 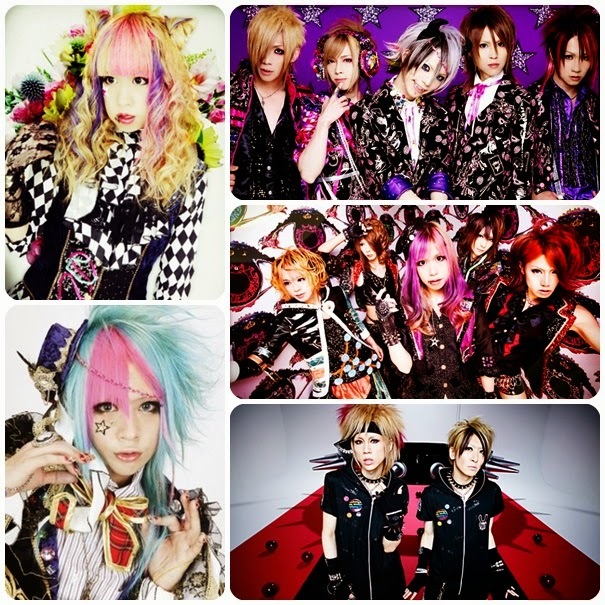 So recently I started getting very nostalgic and reminisced back in the days that I first discovered Jrock. Its been quite a few years now that I've stopped keeping up to date with it because I just found it so hard. I then ended up getting into Kpop which is even more difficult to keep up with! 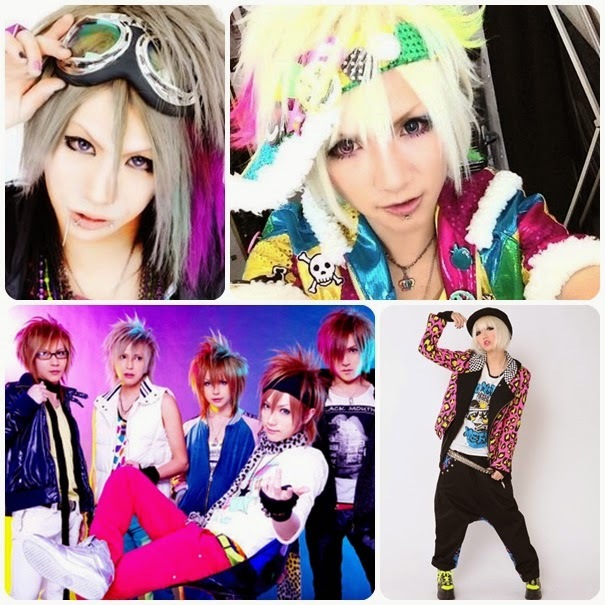 As I watched their old music videos I realised I have never ever tried Oshare Kei which is a style I admire so much because it matches so well with the upbeat and lively style of the music. Back in my teen years I was heavily influenced by LM.C and Takeru of SuG, however I didn't really have the wardrobe to pull it off. My attempts back then were literally awful that I wouldn't even label it as Oshare kei. 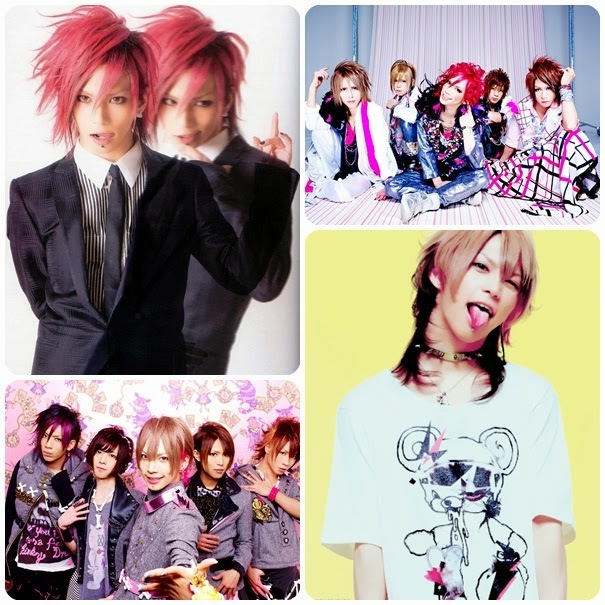 In my opinion, Takeru the lead vocalist from SuG (and also model for Kera) is the epitome of Oshare kei. I admire his style so much and honestly, I wish there were more guys that dressed this way! So I wanted to try and incorporate some of his personal taste into my own outfit. What I admire most about Oshare Kei is that although there are specific elements to the style that makes it recogniseable, you can pretty much be as creative as you want and combine any colours! LM.C have quite a gothic/punk look which makes use of studs, spikes, skeleton prints and black clothing. 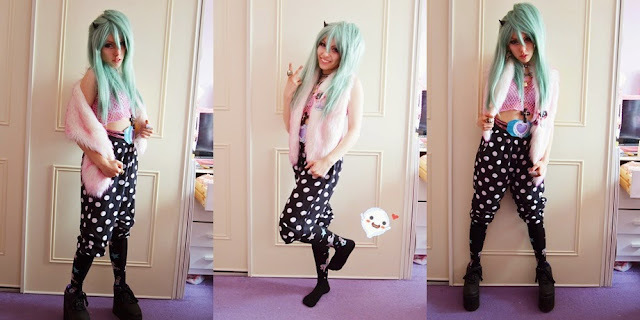 However, Mashiro (pictured in image 1) wears skirts and also has his hair curled which isn't a typical aesthetic in this style, yet the combination of layers and prints conveys it is still Oshare Kei. 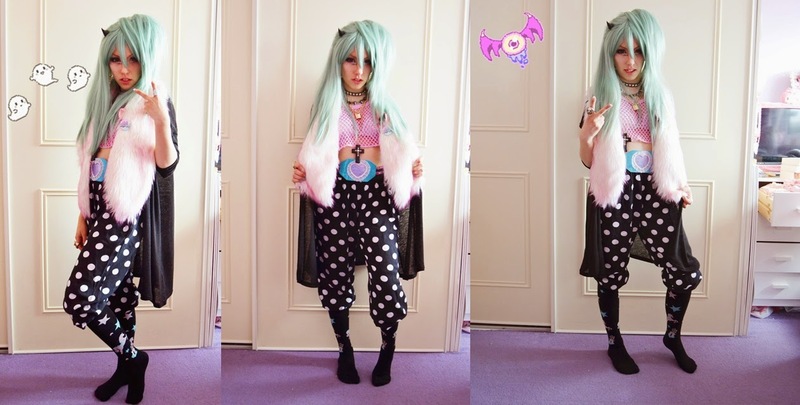 His style also crosses over into Decora which is more of a feminine style mainly worn by women. Since I love pastel colours I knew I wanted to incorporate it into my outfit along with black for the contrast. I knew I wanted to wear my baggy polka dot harem pants as I purposely bought these because it reminded me of Oshare kei :3. I don't actually own any lose fitting t shirts any more - the ones I owned had become so old and faded. Personally I prefer having tight and lose fitted items mixed together, otherwise I feel too swamped in my clothes (I'm super short as well which makes it look strange! > <). I wanted a feminine edge to it - although I do love the boyish aesthetic since it is mainly worn by male artists - I wanted a piece of my own personal style incorporated into it :). I also layered up jewellery and combined the scarf along with the PVC belt as I did not want any empty spaces. 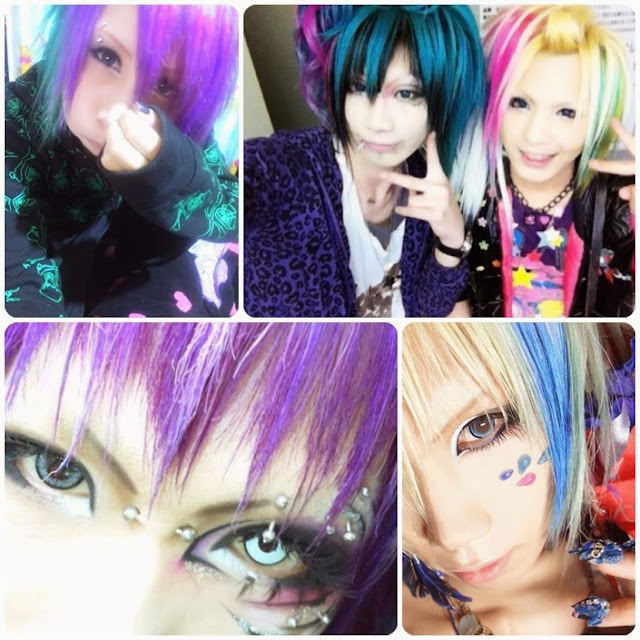 Here are some examples of the make-up I took inspiration from in my look, some of these may cross over into Visual Kei but I love the use of colours along with the face decorations and piercings. As I don't have any facial piercings mainly because of my job and because I'm terrified of needles (I cringed so much just getting my lobes done!) I used silver gems to replicate the appearance of facial piercings. I think it really completes the look. 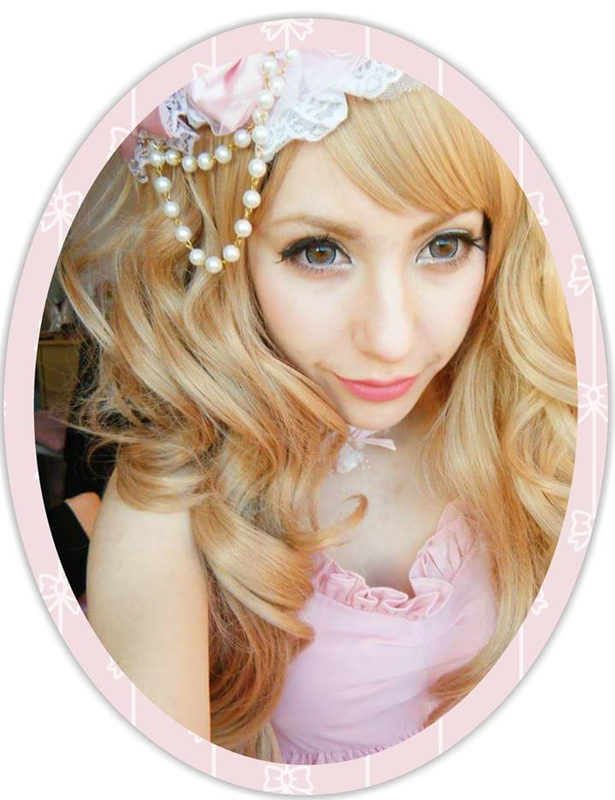 The main attributes to Oshare Kei make-up is extremely thin, slanted eyebrows, circle lenses, false eyelashes and a very pale complexion. A lot of band members make use of heterochromia (where the two eye colours are not the same) and I used my two Princess Mimi lenses in Apple Green and Sesame Grey. I really enjoyed the effect, however those lenses are much better suited to Gyaru and next time I would use very vibrant colours to stand out more as the impact isn't as noticeable with these colours. I really enjoyed the process of Oshare Kei make-up, in some ways it was very similar to how I apply gal make-up, but a little more extreme and there is room to be more creative. I only placed bottom lashes on one eye and tried to make lines around the other eye similar to the example above. I am quite proud of how the eyebrows turned out but they took me so damn long! I only covered half of my brows with glue, powder and foundation and extended my natural eyelashes to create the desired thin, slanted appearance. I chose a straight wig as it works so well with the style, however anyone that knows me well will know how much I can't stand back-combing. It frustrates me so much! Also I have no where to store a wig once it has been styled because I place them back into their clear sealed bags that they were posted in to keep them dust free. So I got a little creative and pulled one section on one side, twisted it up and place two small bulldog clips under the hair. After rearranging the placement to make it look more voluminous I was very pleased with the result as I can still take it down and use the wig for other styles. I dislike changing wigs because I like them to be versatile and once they are styled I feel like its pretty permanent. The fringe was the hardest to keep still and I had to pin some parts back and try to hide the hair clips. The wig was from eBay by a UK seller and there is also a longer version ^^, I just love the vibrancy of this wig and how well it works for Oshare Kei. I definitely felt very extreme in this style, I did not wear it out in public as I was testing the style out, but hopefully one day I'll try it out again because it was so much fun >3<! I really loved Oshare Kei back in high school, but I never tried it. You've definitely given me some inspiration to finally try it out!